The Sweet Bears Contemporary Motion Clock is a rather mesmerizing piece for your little ones. While it keeps them amused, and lulls themes to with the three little colorful bears that swing back and forth rhythmically, it also makes sure that it make no noise at all so that you baby sleeps sound. It’s simplistic shape makes it even more attractive. Whether it is a nursery or your baby’s room, this cutesy Sweet Bears Contemporary Motion Clock is going to make the perfect thing to have near the little bundles of joy. 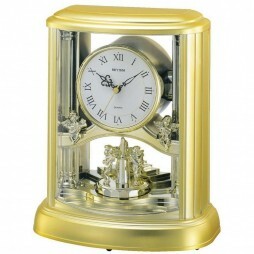 The Contemporary Motion Carriage Clock from Rhythm Clocks is a delight for the lovers of the antiquity and class. The ever so delicate looking clock can be a spectacular addition to your side table. 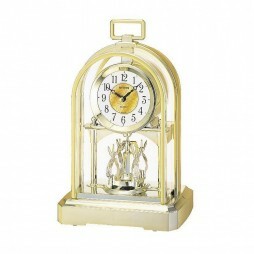 This gem of a table clock is a rather simple, classy and elegant piece with a carriage-clock design. The Contemporary Motion Carriage Clock from Rhythm features a well-rounded piece with curved lines at the top accentuate its face. The time piece stand tall supported by the pendulum with 4 teardrop crystals that are the beauty of it. If you think that there is some charm missing by you bedside, this is it. Wood grain Teardrop Contemporary Motion clock by Rhythm Clocks is an exemplary clock telltale that will make the interiors of your home come to life. The clock has a distinctive German look that you’ll simply love. 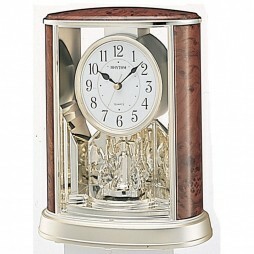 This battery-operated motion clock is a fine piece of artwork that has all the necessary functions. The night sensor and volume control features add to the ease of use. Go ahead and shop for this beautiful piece at an affordable price right away. You’ll be glad you picked this clock and brought a contemporary wall accent into your home. Conventional wall clocks can add great style to your interiors, Wood grain Spiral Contemporary Motion Clock is for you to check out. 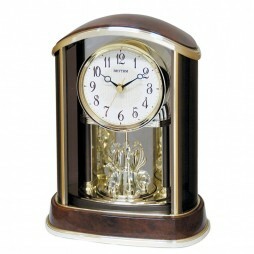 This exemplary clock has a stylish look and is a bestseller from the house of Rhythm Clocks. 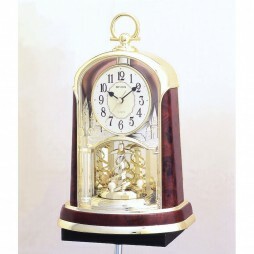 The old world European look that this clock has is something you’ll simply love to bring into your home. It features a pearl-studded pendulum and a star figure at the top. The spiral accents of this clock make it a phenomenal wall accent to buy. Get more details about this product here! 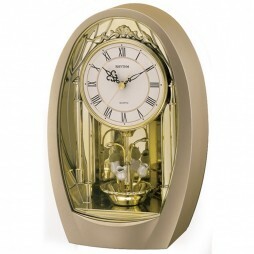 Just as the name goes, this Angel Clock Contemporary Motion Table Clock is a seraphic wall clock by Rhythm Clocks. It has premium finish with an animated movement. The musical angels that are added to this clock will give your home an enchanting vibe. The pendulum has a rotating motion that you’ll absolutely fall in love with. At the strike of the hour, this gorgeous clock plays the melody “Green Sleeves”. Made from ABS Plastic, this contemporary Motion Clock runs on battery, so you don’t have to worry about the wires or windings. Crystal Flare Contemporary Motion Table Clock is the very face of elegance with every inch of it set in tasteful craftsmanship. The tall look makes it a piece worth looking at. To it, what adds more grace is the elegant faux burl wood frame in a contrasting color. The round white dial with hour markers and arms that are not too fancy render it easy on the eyes. But, what adds absolute glamour to it is the Crystal Flare shaped pendulum that holds 8 Swarovski crystals. Thinking of the perfect spectacle to match your glamorous living room? 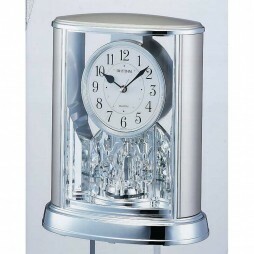 The Crystal Flare Contemporary Motion Table Clock might be just what you have been looking for. Bring in the pristine dazzle of silver into your home with this beautiful Silver Teardrop Contemporary Motion Table Clock by Rhythm Clocks is an exemplary clock telltale that will make the interiors of your home come to life. The clock has a distinctive German look that you’ll simply love. This battery-operated motion clock is a fine piece of artwork that has all the necessary functions. The beautiful silver finish of this clock makes it a perfect pick. Go ahead and shop for this beautiful piece at an affordable price right away. You’ll be glad you picked this clock and brought a contemporary wall accent into your home. If you simply love angelic table clocks, this Tulip Contemporary Motion Table Clock is the one for you to check out. 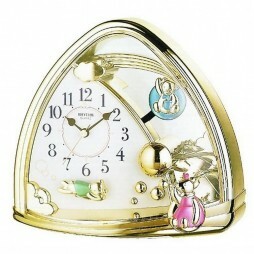 Made from high-quality ABS plastic, this clock comes with a very pretty design. Love blooms as this telltale has a pair of lovebirds gaze at the floral basket nest. The rotator motion of these baskets adds more glamour to the look of this timepiece. Apart from its aesthetic charm, the clock also has a fine musical feature. It plays beautiful tunes every hour. Grab this wonderful telltale for your home right away! These clocks come alive on the hour. They are sure to entertain.